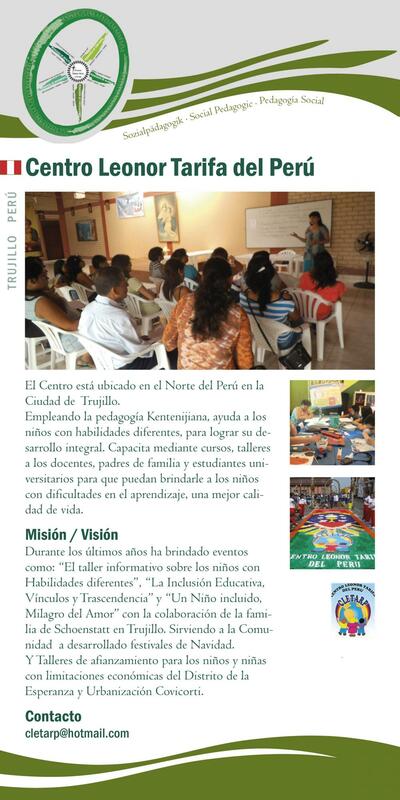 The Centre is based in Trujillo, in the north of Peru. Based on Fr Kentenich‘s pedagogy, the Centre supports children with special needs, so that they can be fully integrated into society. In addition, there are ongoing educational courses for teachers, parents and students. These pass on ways and means by which special needs children can have a better quality of life in their immediate surroundings. In the last few years, with the co-operation of the Schoenstatt Family in Trujillo, we have held a variety of events: “Information workshop on special needs children”, “Inclusion in the fields of education, bonding and transcendence”. Workshops take place to strengthen children with limited financial means in the “La Esperanza” suburb and the Covicorti township.